On Tuesday (9 July 1996), we left the four presidents in Mount Rushmore meet and greet their thousands of other fans who kept on flocking, while we continued our adventures in the Black Hills (PahƒÆ’†’¡ SƒÆ’†’¡pa in Lakota) National Forest. We spent most of the next morning with “Crazy Horse“ (ca.1840-1877), an Oglala Lakota warrior who took up arms against the U.S. federal government to fight against encroachments on the territories and way of life of the Lakota people. “Crazy Horse“ led the Battle of Little Bighorn in 1876. His father was “Waglula” (Worm) and his mother “Rattling Blanket Woman.” “Crazy Horse“ had three wives””‚”Black Buffalo Woman,” “Black Shawl Woman“ and “Nellie“ Laravie. From the Wind Cave National Park, we drove northwest on U.S. 385 to visit the “Crazy Horse“ Memorial, consisting of the incomplete carving (monument) of “Crazy Horse“ on Mount Thunderbird, the Indian Museum of North America, and the Native American Cultural Center. It is located in Berne, 17 miles southwest of Mount Rushmore, between Custer and Hill City. The Black Hills are a small, isolated mountain range rising from the Great Plains in western South Dakota and extending into Wyoming. It is the location of the tallest peaks of continental North America east of the Rockies, e.g., Harney (7,244 ft.), Odakota (7,205 ft.), and Bear (7,166 ft). This mountain range encompasses the 1.25 million-acre Black Hills National Forest managed by the U.S. Forest Service. The National Park Service administers the national parks, monuments and memorials. Wikipedia describes Black Hills as “a very spread-out urban area” with a population of 250,000.Important Black Hills cities and towns include Hot Springs (pop. 4,129), an old resort town in the southern Hills; Custer (pop. 1,860), a mining and tourism town and headquarters for Black Hills National Forest; Keystone (pop, 311), gateway to Mount Rushmore; Hill City (pop. 780), a timber and tourism town in the center of the Hills; Lead (pop. 3,087), home of the defunct Homestake [Gold] Mine; Deadwood (pop. 1,380), a historic and well-preserved gambling mecca; Spearfish (pop. 8,606), home of Black Hills State University; Sturgis (pop. 6,642), the seat of Meade County originally a military town now famous for one of the largest motorcycle rallies in the world; Belle Fourche (pop. 4,565), a ranching town; and Newcastle (pop. 3,065) in Wyoming, now the center of the Black Hills petroleum production. 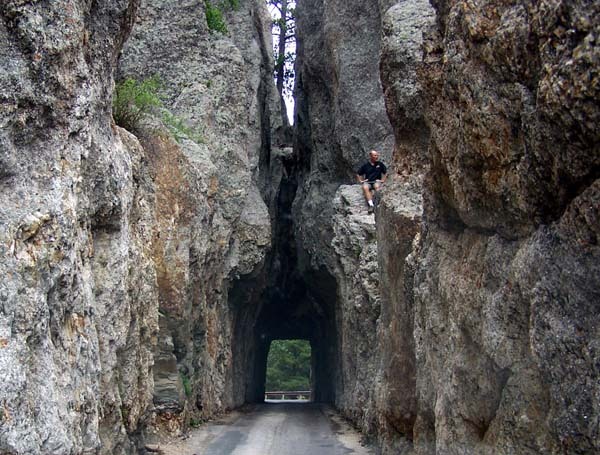 In 1996, we drove west from Keystone on SR 244 and south on SR 87″”‚the so-called “Needles Highway”””‚to visit the 71,000-acre Custer State Park, South Dakota’s first and largest state park. On SR 87, we stopped at Sylvan Lake, just to the southwest of Harney Peak, to absorb the fascinating beauty of the tallest mountains in the Midwest. We walked along the lake to the dam, where the four-mile Sunday Gulch Foot Trail starts. We recalled our walk along the trail on a Wednesday (5 Aug.) in 1987. On this occasion, however, we found the trail closed. The drive along the 14-mile Needles Highway brought memories of our drive through the Tioga Pass in Yosemite and the more recent experience of our drive through the Beartooth Pass in Yellowstone. We passed the Needles and Cathedral rock formations, as well as the Woodpecker Ridge to reach Legion Lake, where we stopped to walk along the lake looking for the Badger Hole, the home of poet laureate Charles Badger Clark (1883-1957), which we visited in 1987 but eluded us on this occasion. We also drove briefly on the 18-mile Wildlife Loop Road to visit a prairie dog town, where we met “the friendliest prairie dogs” we encountered. Some of the park’s wild “begging” burros (donkeys) live at the southernmost end of this road, which follows the varied landscape offering views of the higher portions of the Black Hills, badlands, endless sky and lush streambeds. Our destination for the day was the 28,295-acre Wind Cave National Park, south of the Custer State Park. We stopped at the Visitor Center and Cave Entrance, where we bought tickets to join the 6 p.m. cave tour, which turned out to be “too bland.” The cave is notable for its displays of the calcite formation known as boxwork. Theodore Roosevelt declared it a national park in 1903. After dinner, we repaired to the amphitheater to join a program titled “The experiences of a cave explorer.” Participating in programs arranged by the park rangers was one of the joys of camping. We camped overnight at the Elk Mountain Campground. Wednesday (10 July 1996) morning, we ate breakfast, folded our tent and went for a walk along the Elk Mountain Nature Trail. For us, trail walking was another joy of camping. It always reminded me of my boyhood exploits in the woods of Pathegama. Other joys of camping, as I have recorded in previous tales of my travels, include the feeling of oneness with nature; the ability to adjust to ongoing changes in habitat; learning the value of good neighborliness; and the joy of experiencing the interconnection of anatta, anicca and dukkha“”‚the three signs of existence. We learned on our extended Black Hills camping trip in 1987 that the joys of camping do not come without accompanying jitters. We set up our tent at an idyllic spot called the Trout Haven Resort and Campgrounds (vaunted as “15 acres of paradise”) on U.S. 385 on a Monday (3 Aug.) evening after we toured the historically notorious towns of Deadwood and Lead. The resort (some 33 miles north of Crazy Horse; or some 19 miles south of Deadwood) provides two ponds full of trout and sells the fish to the catcher on a per-inch charge. Cleaning is free but cooking costs extra. We felt joy when Junius caught a trout or two without any ado, and Yoke-Sim cooked the “expensive” fish for our dinner. I collected firewood for a campfire. More joy! But our joy didn’t last that long. Fear gripped us when a storm of rain and hail pelted on our tent and almost blew it away. I had to hold on to it with all my might. Fortunately, Carmel, 3, who was fast a sleep, did not wake up to see the scary commotion. We had similar jitters on the night we camped on Sportsmen’s Beach, Lake Walker, Nevada, in summer 1983″”‚18 Aug.””‚five months before Carmel’s birth. Rain and strong winds almost unplugged our tent on that day too (See Travels-19). I have recorded another kind of jitters I experienced at Hetch Hetchy in Yosemite in mid-August 1983 (See Travels-20). As we passed Trout Haven in 1996 on our revisit to Deadwood, we reminisced over the jitters once again. In Deadwood, we bought food at a supermarket and ate a picnic style lunch at the city park on Sherman Street. In 1987, we explored the historic Main Street and learned about “Calamity Jane,” “Madame Dixie” and their charges at the Green Door. And in Lead, Junius and I joined a tour of the historic Homestake Mine. In 1987 (on Sunday 2 Aug.), we camped overnight at the city campground in Spearfish as well. We attended the 8.15 p.m. performance of the Black Hills Passion Play in an open-air amphitheatre (seating 7,000), with masses of evergreens and the towering Lookout Mountain as a backdrop. Despite thunder, lightning and rain, the play went on. It was a joy to get back into our tent and fall sound a sleep. Until its last performance on 31Aug. 2008, the show was produced under the auspices of Passion Player Josef Meier’s daughter Johanna, a world-famous opera singer who had her debut in the play at the age of five weeks. We drove a distance of 1,330 miles on our Toyota Camry wagon to complete our 1987 Black Hills camping excursion. Our more ambitious 1996 tour of Yellowstone and Back Hills on the same vehicle covered a distance 2,453 miles. Our return trips from the Black Hills, both in 1987 and 1996 (see Figure 1) gave us both joy and jitters. 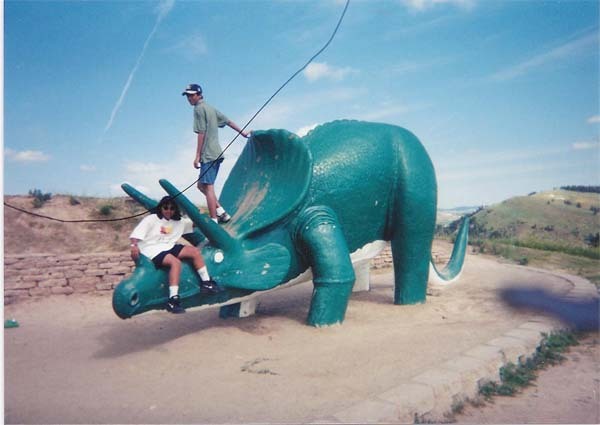 In 1996, we left Deadwood about 3 p.m. (Wednesday 10 July), and Junius drove us some 114 miles to Faith on US 212. Yoke-Sim continued driving east on U.S. 212 the next 100 miles through the Cheyenne River Indian Reservation to the Missouri River crossing, near Gettysburg. We stopped at the enchanting rest area on a hill overlooking the river to eat dinner disregarding the loss of one hour as we shifted to Central time at the crossing. Our joy blinded us to the approaching winds and the onset of gloaming. I took over driving and headed north on U.S. 83, then east on U.S. 12. By the time I reached Ipswich, after driving 93 miles, I could hardly see the road because of winds and dark clouds. Junius emerged as a 16-year-old heroic boy who took over driving from me at Ipswich, filled up the car at Aberdeen, some 30 miles ahead, and drove us all the way to Fargo Moorhead””‚a distance of 215 miles. We reached home at 2 a.m. Thursday. In 1987, we took two days after leaving Black Hills to reach Fargo-Moorhead. We spent Thursday (6 Aug.) visiting several museums””‚the Museum of Geology, Dahl Fine Arts Center, the Sioux Indian Museum, and the Minnilusa Pioneer Museum. We stopped at Storybook Island (on Sheridan Lake Road) and Dinosaur Park (on Skyline Drive) to provide amusement to Carmel, 3, and Junius, 7. We camped overnight at the Lake Park Campground, on the western shore of Canyon Lake in Rapid City. Friday (7 Aug.) morning, we left the campground early because of impending rain. Yoke-Sim cooked our breakfast at a way shelter in Canyon Lake Park on the western shore of the lake. Then, we left the Black Hills on I-90 to visit the Ellsworth Air Force Base, about 13 miles to the east. We joined the 9.20 a.m. guided tour of the base and browsed the South Dakota Air and Space Museum. Next, we drove 76 miles southeast to visit the 244,000-acre Badlands National Park, which we entered at Wall on SR 240. Despite the rain, we covered the entire Badlands Loop to see the “spectacular examples of weathering and erosion.” We ate lunch at the Cedar Pass Visitor Center, and left the park about 4 p.m. We had to drive another 124 miles east and north (on I-90 and U.S. 83) to reach Pierre (pop. 14,072), the capital of South Dakota, at 8 p.m.
We camped overnight at the free campground (facing the Missouri River) at Griffin Park in Pierre, some 70 miles southwest of the Missouri crossing where we stopped for dinner on our 1996 tour. Junius was highly thrilled when we crossed the time zone to Central. A free campsite facing the river was almost a dream come true! Yoke-Sim cooked our dinner without delay on the spot. Because of overnight rain, we got up late Saturday (8 Aug.) morning. After breakfast, we left the campground to visit the Oahe Dam (in North Stanley), where we joined a one-hour guided tour of “the world’s second largest rolled earth-fill dam.” Back in Pierre, we toured the state Capitol and the Robinson State Museum. We ate lunch at the Pierre Mall, which we left at 2 p.m. We reached Watertown (pop. 20,247), 190 miles further east, about 6 p.m. There, we allowed Carmel and Junius to have all the fun they needed at the Bramble Park Zoo. We ate dinner at the employee””…”owned Hy Vee. 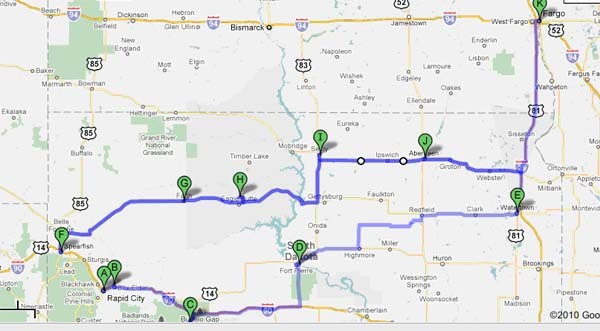 Yoke-Sim and I shared the 146-mile driving distance between Watertown and Fargo. I drove the final leg of our return trip “even though I found driving in the gloaming somewhat discomfiting.” Jitters of camping! 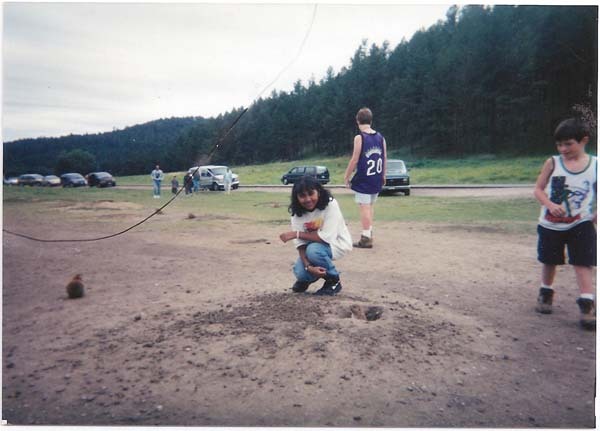 1996 Trip””‚F=Deadwood/Spearfish; G=Faith; H=Cheyenne River Indian Reservation; I=Selby; J=Aberdeen; K=Fargo. 1987 Trip””‚A=Rapid City; B=Ellsworth AFB; C=Badlands National Park; D=Pierre; E=Watertown; K=Fargo.